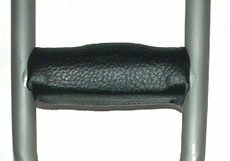 Thomas Fetterman Leather Saddle Grips, Black, Pair: Thomas Fetterman Leather Saddle Grips are very comfortable handgrips designed to fill the "palmar arch" of our hands. These grips fit over a fixed handle post but works just as well over a standard removable underarm crutch handle. The shell is made of a handsome black natural cowhide leather that covers a closed cell polyurethane pad. There is a Velcro closure on the bottom for easy removal. The grip does not rotate on the handle. Sold as a pair.